Zivanta designed a platform to promote D2E, as an Offshore outsourcing Aggregator, which delivers clear, focused and measurable results. Zivanta developed a partnership approach and has evolved with the client. The process began with identifying the key marketing elements which consisted of identifying the goals, recognizing challenges and a clear understanding of the target demographics. The next step involved the creation and maintenance of an effective website platform it is the hub of all online marketing activity and lead generation. The next step was to bring in new qualified visitors to the site with the help of blogs, content in the form of news, social media integration and onsite and offsite SEO. This is an ongoing process and constant monitoring is required for its success. 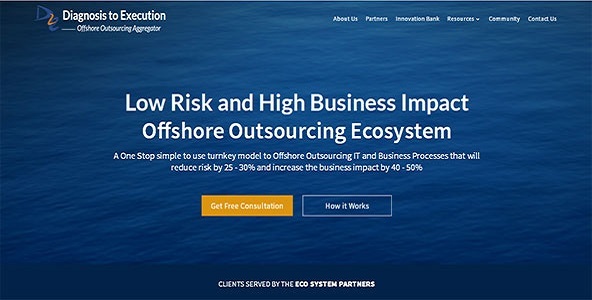 D2E is an Offshore Outsourcing ecosystem for IT services. It is managed by industry veterans who have set up some of the largest Offshore Development Centers in the world including the likes of GE and several prominent Wall Street institutions. They are based out of their offices in the United States and India.D2E further provides a single window for all IT Offshore Outsourcing requirements. It brings in the best in class professionals and partners in turnkey software application development and maintenance, managed services, software quality assurance testing and software consulting. Each D2E leader has honed their skills on the job, handling complex multi-million dollar projects. They are considered thought leaders in their respective domains by their peers and are sought after for advice and mentorship. They give honest and studied opinion and provide solutions which are transformational for clients. The biggest challenge involved designing the website in such a way as to generate lead and draw in more customers. The website’s performance was also high on the list of priorities. It’s an asset that works around the clock to draw in visitors, convert them, and helps in hitting the target. The issues with website management include a variety of different factors, from writing and optimizing the content to designing beautiful web pages. The biggest challenge was to market and attract an international audience and increase footfall. Social Media Marketing –Various social media sites are used to create awareness about D2E Consulting and to increase its web presence. It includes boost posts on Facebook, posts in Google+, LinkedIn and on Pinterest. Posts are also shared on groups related to IT and Offshore outsourcing technology. Content Writing- Blogs are published weekly on the D2E website on topics related to Offshore Outsourcing Services Aggregator and also on topics which the US-based crowd would like to read on offshore outsourcing. Announcements on both past and upcoming events like Webinars are regularly put up to increase the footfall of visitors along with updates on the ecosystem community. Newsletter – A weekly newsletter consisting of blogs, tech news, offshore outsourcing news, partner news, infographics, and announcements. (All information are taken from the D2E website). They go a long way in building relationships and maintaining a regular contact with prospective clients. Newsletter content builds a broader picture and encourages readers to find out more detailed information on the company website. The D2E website is performing well to draw in visitors and the google ranking of the website has also shown a positive trend. The content updated on the D2E website has increased the number of footfalls to the site by drawing in the US diaspora.